Image via SeeTickets.com/Reading and Leeds Festival. Reading and Leeds Festival returns this year with another killer line up, promising to end your summer on a high. As always the festival takes place on August bank holiday weekend (Friday 25th – Sunday 27th). A huge variety of bands and artists have been booked this year, ensuring there’s something for everyone. The festival has returned to the classic three headliners this year, opposed to last year’s five. Kasabian and their new album For Crying Out Loud will be found headlining Friday night (Reading) and Saturday night (Leeds). Following the release of their sixth studio album the audience can expect new festival anthems such as ‘Ill Ray’, as well as past classics like ‘Club Foot’ and ‘Fire’. 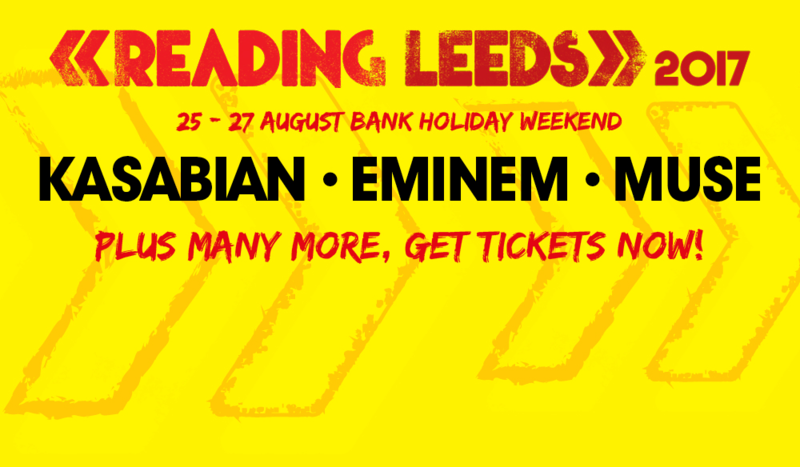 Eminem returns to the mainstage after four years to headline Reading on Saturday and Leeds on Sunday; if his last visit in 2013 was anything to go by, the crowd are in for an amazing experience with plenty of special guests. Muse get the honour of opening the festival headliner slot at Leeds on Friday, and closing the festival at Reading on the Sunday. Following the release of their album Drones in 2015, and an awe inspiring set at Glastonbury last year, as well as the promise of new music soon, they are sure to be a memorable watch. Aside from the headliners, there’s over 150 acts to check out over the weekend, plus more to still be announced (anyone else spotted the two slot gap on the mainstage on [L]Friday/[R]Sunday??). Liam Gallagher makes his festival debut with promises of tracks off his upcoming album As You Were as well as Oasis classics. Californian metal band Korn are placed high on the (R)Saturday/(L)Sunday mainstage off the back of their new album The Serenity of Suffering, reminding us of the versatility of the festival. Elsewhere, You Me At Six finally get the recognition deserve and headline the NME stage; they are also joined by Sub Focus and Oh Wonder on the (R)Friday night/(L)Saturday. Flume, Frank Carter & The Rattlesnakes, Halsey and The Sherlocks can also be found on the NME stage throughout the bank holiday weekend. With so many promising acts, it’s hard to not talk about the potential surging from the other stages such as the Dance Stage, The Pit/Lock Up, The Festival Republic and The Radio 1Xtra stage. Highlights across the weekend are guaranteed to be found in the Presence of Fatboy Slim, Jaguar Skills, Mistajam, Gnarwolves, Asteroid Boys, The Amazons, The Hunna, Mist and Bugzy Malone. If you’re keen to see any of these acts, tickets are available here (R) and here (L). Check back to The Edge to get updates on the festival as they come and the lowdown on all the acts you must not miss at Reading and Leeds. Check out last years highlights below.